Pocono 3-Drawer Full Size Storage Bed is a natural selection for your children's bedroom. Its convenient 3 storage drawers are ideal to store away beddings, clothes, toys, books and other miscellaneous items and are mounted on solid metal slides. Pocono bed is also entirely reversible, so you can decide on which side you prefer having the 3 drawers. Pair the Pocono Full Size Storage Bed with matching Full Size Headboard #4653 for a complete set. Pocono Collection from Nexera is a timeless and functional collection offered in a rich Espresso laminate finish with decorative metal handles. Part of the Pocono Collection from Nexera. Visit nexeradistribution.com for more details. Fits a standard full size mattress. No box spring required. The Alegria Collection from Nexera is a timeless and functional bedroom collection offered in a rich natural maple finish with hardwood knobs. The storage bed with matching bookcase headboard is the perfect starting point to create your own perfect modern bedroom set with lots of storage. The Alegria storage bed offers 3 convenient storage drawers mounted on metal slides, ideal to store away beddings, clothes, books and other miscellaneous items. The drawers are reversible and can be assembled on either side of the bed. The Nexera full size 3 drawer bed features a unique metal and hardwood slat construction allowing for easy assembly, sturdy construction and easier handling. This Full Size 3-Drawer Storage bed offers 3 convenient storage drawers mounted on metal slides, ideal to store away beddings, clothes, toys, books and other miscellaneous items and is also entirely reversible, so you can decide on which side you prefer having the 3 drawers. 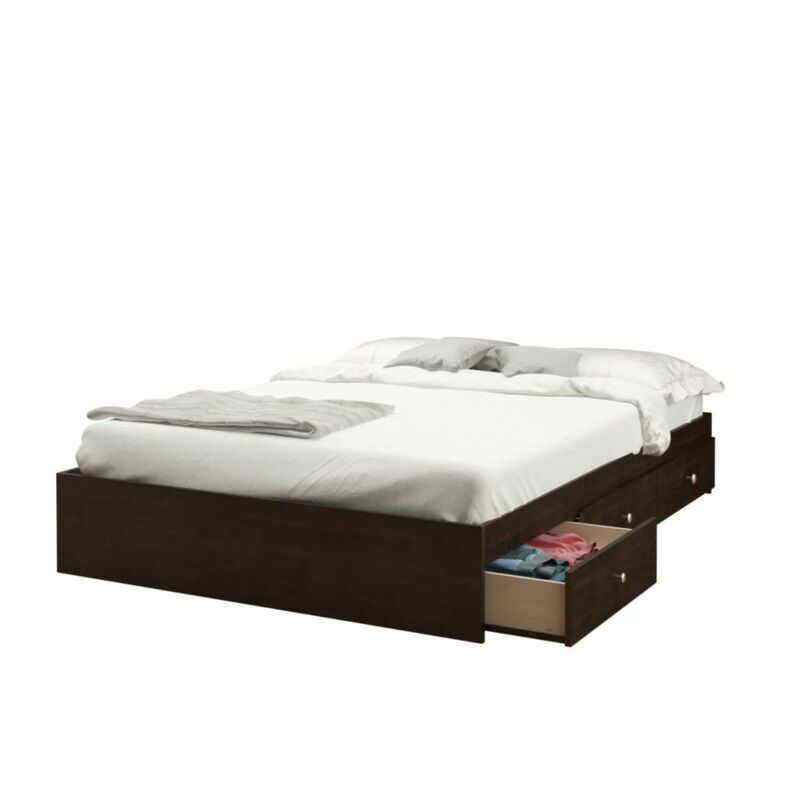 The Nexera Queen Size 3 Drawer Bed features a unique metal and hardwood slat construction allowing for easy assembly, sturdy construction and easier handling. This Queen Size 3-Drawer Storage bed offers 3 convenient storage drawers mounted on metal slides, ideal to store away beddings, clothes, toys, books and other miscellaneous items and is also entirely reversible, so you can decide on which side you prefer having the 3 drawers. Pocono Full-Size 3-Drawer Storage Bed in Espresso Pocono 3-Drawer Full Size Storage Bed is a natural selection for your children's bedroom. Its convenient 3 storage drawers are ideal to store away beddings, clothes, toys, books and other miscellaneous items and are mounted on solid metal slides. Pocono bed is also entirely reversible, so you can decide on which side you prefer having the 3 drawers. Pair the Pocono Full Size Storage Bed with matching Full Size Headboard #4653 for a complete set. Pocono Collection from Nexera is a timeless and functional collection offered in a rich Espresso laminate finish with decorative metal handles. Pocono Full-Size 3-Drawer Storage Bed in Espresso is rated 3.4 out of 5 by 8. Rated 1 out of 5 by mady from DONT BUY THIS Bought this bed frame.. yea it is awesome with the storage and it’s easy to assemble. It didn’t even last a month. The screws started to pull away and the whole thing was falling apart. I had to reinforce it with brackets on the corners. Home Depot would only refund me if I sent back th bed frame (I didn’t cause I still needed a bed frame and didn’t want to wait for my money to come back) and the manufacture would only send replacement parts. Really disappointed in it cause it was a waste of 300$. Only reason I’m keeping mine is to try and at least get my moneys worth from it... Wouldn’t recommend it. Look for something with better quality!! Rated 5 out of 5 by Mario from Very Practical 3 drawer storage bed Excellent service from Home Depot, quick delivery . Very good assembly instructions. Rated 3 out of 5 by Lindsey from Very Simple Purchased 1 month ago, was looking for a cheap set up with storage. It does the job well, assembly is a challenge for sure. the drawers' edges (actually all of the edges) are very sharp. You get what you pay for. Rated 4 out of 5 by Nickname required from Very happy with this bed frame! I've had it for a few months and the extra storage has mad all the difference! Not to mention that it was very easy to assemble. The only thing I didn't realize was the drawer at the head of the bed isn't easily accessible with a bedside table. So I put stuff I don't need all the time in that one. Rated 4 out of 5 by Magnum from Great bed for my Daughter We purchased this bed for our daughter and delivery company issues aside the bed went together easily. The bed has some nice little features to it like corner bump guards to avoid scratching you leg. The bed was solid once assembled and the sliders for the drawers make its operation very smooth. If the matching head board was a little less we would definitely complete the set as it looks very elegant and my daughter is very happy. Make sure that you have a second adult or teen to help with assembly and you will have a much easier time assembling. Is there a weight limit on this bed...i.e. most say 300 pounds or 500 pounds depending upon construction?